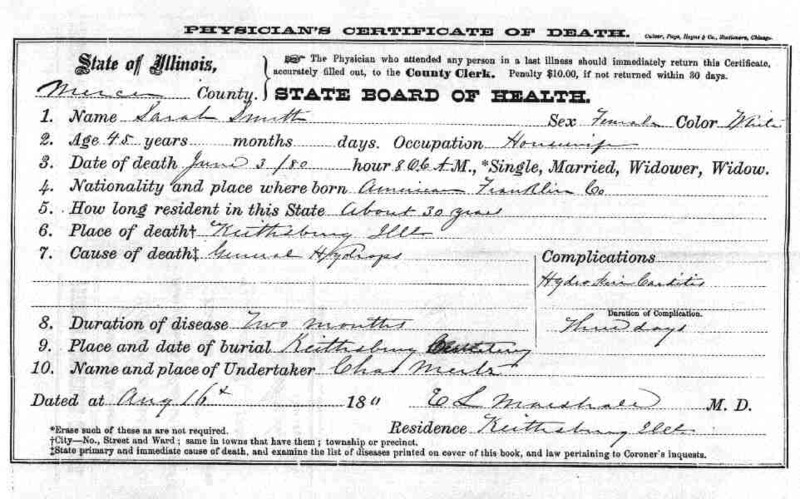 You have to love a death certificate like this one from Mercer County, Illinois. The place of birth for Sarah Smith is listed as “Franklin County.” No state is given. One might think it is Franklin County, Illinois, but it is not. The actual county is in Ohio. My transcription of the death certificate only included what was actually on the death certificate. My discussion of the state of her birth is clearly indicated as not being on the death certificate and being separate from it. Sarah was actually the daughter of Archibald and Lucinda (Wickiser) Kile who migrated to Mercer County, Illinois in the late 1840s.